A romantic location and one of the best places along the shores of Lake Ontario to watch the night illumination of the skyline of the Toronto, Ontario is from Centre Island. The reflections of the skyline span across the calm waters of Lake Ontario, with two of the most prominent structures, the CN Tower and Rogers Centre, showing off their purple and pink hues. The CN Tower is the 2nd tallest building in Canada standing at a height of 553 metres. The dome shape of Rogers Centre is the indoor/outdoor sports centre, formerly known as the Sky Dome which has been recognized as one of the world's best entertainment centres. Picture of Centre Island in Toronto, Ontario, a romantic place to enjoy the scenery of the city skyline at night. 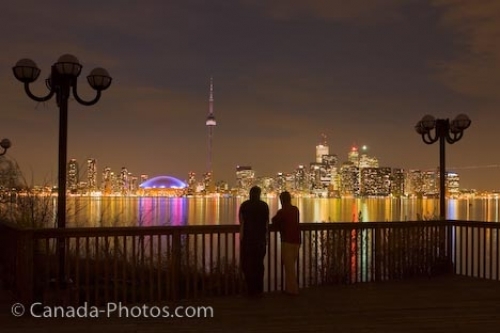 ... Tranquility surrounds this couple as they stand at the viewpoint taking in the beauty of the night skyline of Toronto. Skyline of Toronto City seen from Toronto Island's (Centre Island) at night, Toronto, Ontario, Canada.